They only turn 1 once, so make it special and unforgettable! With our variety of crowns, hats and outfits, we know that we can assist in creating this festive memory. Guaranteed vibrant photo memories from the popping bright colors and the 3 dimensional look. Relax, your little guy will be the prince of the party. Available in 6-12 months and 12-18 months. Onesie Care: Hand wash cold for longer applique life; lay flat to dry; use cool iron to set the applique pieces to their original flat position. Leg Warmer Care: Hand wash cold; hang to dry. Made of 100% Soft Breathable Cotton. Due to our small level hand manufacturing, the color, cut and design of fabric on the onesies may vary slightly. Birdy Boutique is a small business owned by two sisters who are wives and moms. Joanna is a retired elementary school teacher, has two lively toddlers, and resides in Michigan. Barbara is a retired Army officer, has two very energetic kids, and lives in Hawaii, her husband's latest duty station. We appreciate you taking time to consider one of our products as a birthday option for your child (because it's kind of a big deal)! 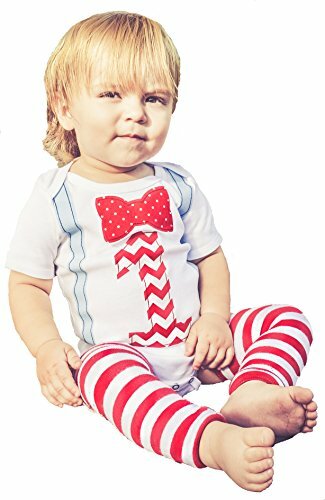 Cutest first birthday memory, wear this onesie shirt again and again all year long with the included leg warmers or shorts/pants! Stunning 3 dimensional sewn on applique! You'll never worry about pieces peeling or falling off. Mommy designed, owned, and operated in the USA! A small grateful family business committed to quality children's products. Cake Smash? Yes please! Striped red white leg warmers are a great accent piece to this or any other outfit; Reuse for Christmas, Valentine's Day or for cute knees! Very stretchable and versatile. Presewn and ready to ship lightning fast so that you can focus on your little one's first birthday party.